The British pioneers cultivated coffee in the hilly tracts of the Western Ghats in forest soils, rich in organic matter and humus. Hence, coffee grew luxuriantly because of the nutrient rich soils and excellent shade pattern. More importantly, prior to 1989, expansion of Coffee Plantations into new areas and Agro climatic regions was restricted by the Coffee Board under the purview of the Coffee Act. Sale of Coffee was also tightly regulated by the Ministry of Commerce, under which the Coffee Board functioned. The early 1990’s saw a wave of liberalization necessitated by the action of the Planting community resulting in the abolition of the Coffee Act which enabled the Planter’s to freely sell their coffee as well as expand their Plantations into uncharted territory. 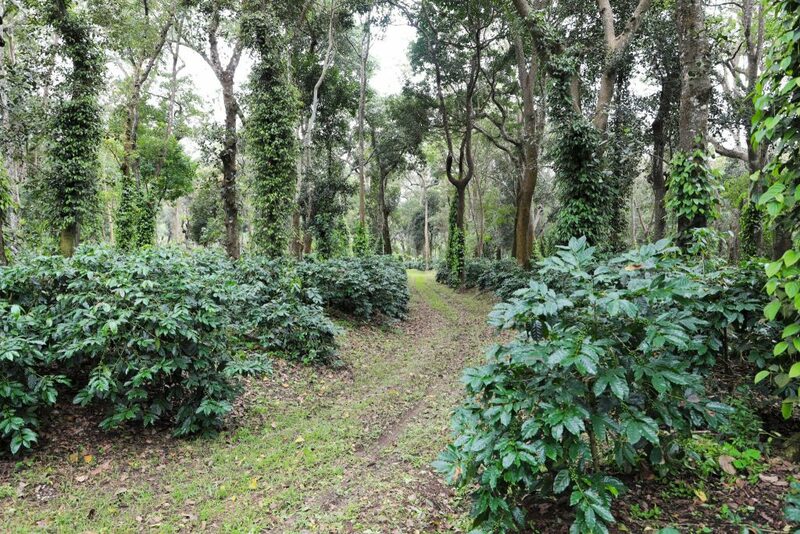 Over the years coffee cultivation shifted to newer areas like pasture lands, wet lands, uplands and totally newer areas with very low soil fertility. (Unfit for Coffee Cultivation). This posed a new challenge to the Coffee Planter’s. The yields in the newly opened blocks suffered both qualitatively and quantitatively. At this juncture, it is important to realize that Studies on the effect of erosion have shown that the downfall of many flourishing empires was primarily caused by soil degradation. If soil loss is greater, than soil development, due to accelerated soil erosion then the agriculture systems in the world will be seriously threatened. This fact is more relevant to coffee. The survival of the coffee bush depends on the possibility of providing adequate humus and organic matter on a periodic time frame to keep the soil microbial activity at its peak. Thus the important question that comes to mind is finding out ways and means of maximizing the efficiency of soil without depleting the balance of soil nutrients. Such soils has to be amended from time to time with organic matter and chemicals to support the growth, development and productivity of the coffee bush. However, timely addition of compost took a back seat, because, preparation of Compost was laborious and due to the unavailability of both labor and raw material, more and more planters started applying chemical fertilizers indiscriminately. This was one among the top reasons for the decline in soil fertility and soils becoming sick. The British pioneers advocated shade coffee with a very high tree population which used to shed their leaves during monsoon and bear fruits twice a year. 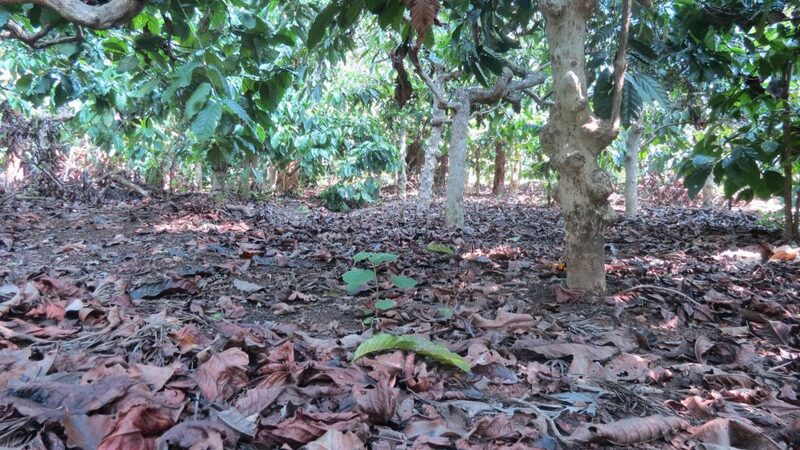 As such at any given point inside the coffee ecosystem one could find a thick layer of mulch and the fallen leaves used to act as a blotting paper to absorb untimely or torrential rains. Runoff and erosion was negligible. In fact the method was so efficient that the recycling of nutrients was very effective and the soil system very resilient. In the past few years, more and more Planters are advocating sun loving coffee and reducing the shade trees to maximize yields. 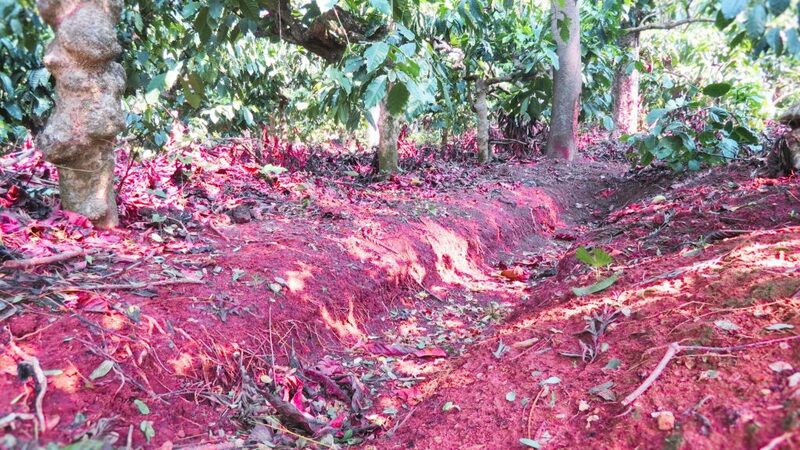 This method of cultivation has disastrous consequences in terms of accelerated soil erosion. It is not wrong to quote that many soils have already turned sick. Natural processes, involving organic matter decomposition, addition of compost, leaf litter etc can take more than 500 years to form 2 centimeters of topsoil. In the past few years, more and more Planters are advocating sun-loving coffee and reducing the shade trees to maximize yields. This method of cultivation has disastrous consequences in terms of accelerated soil erosion. It is not wrong to quote that many soils have already turned sick. Natural processes, involving organic matter decomposition, the addition of compost, leaf litter etc can take more than 500 years to form 2 centimeters of topsoil. Irrespective of the terrain or Agro climatic region, it is a prerequisite to have well drained, deep, neutral soils with plenty of organic matter to sustain the coffee bush for a number of years. Only then can one expect sustainable yields year after year without affecting the productivity of the farm. 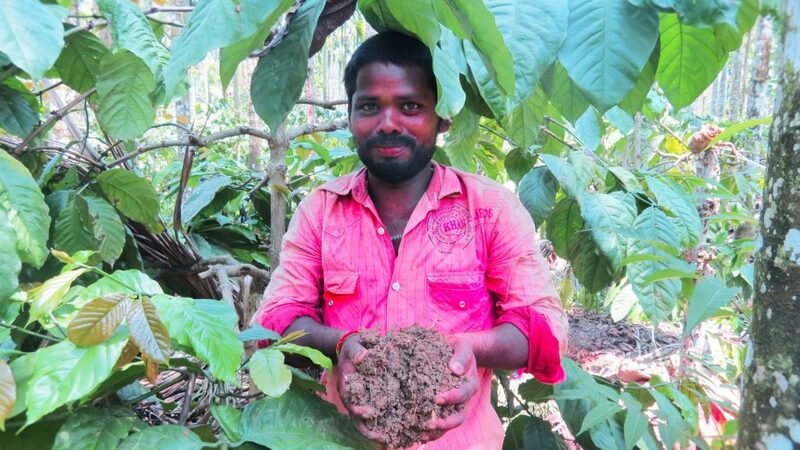 The Coffee Agro climatic regions in India comprise of soils which may vary from red and lateritic. The soils differ in texture from sandy loam to clayey loam. The color varies from light grey to deep red. Each coffee Agro climatic region can have all the above mentioned soil profiles or just one. The Bababudangiris, located in Karnataka, the birth place of Indian Coffee and the Nilgiris , located in Tamil Nadu, where coffee is extensively grown is gifted with red ferruginous clay soils. The characteristic feature of such soils is that they have good aggregating ability, retain the ideal soil moisture and are generally well drained. They are soils with varying amounts of organic matter, minerals and nutrients and acidic to neutral in reaction. The total soluble salts are well below the sensitivity limits. Although the average yield per acre of coffee is very low in comparison to other coffee producing Nations in the bean belt (Brazil, Indonesia, Vietnam, Columbia), several measures can be adopted to improve yields per unit area. First and foremost is understanding soil as a living entity. Enhancing and sustaining coffee and multiple crop productivity depends on the soil profile. Soil has several components of mineral, organic matter, air and water, the proportion of which vary from field to field. An average soil sample is 45% minerals, 25% air, and 5% organic matter (less in degraded soils).These constituents are the foundations of a ideal ecosystem which dictates sustainability for a number of years. Multiple parameters such as hydrogen ion concentration, electrical conductivity, presence of major and minor nutrients along with trace elements in addition to the organic matter status play a key role in determining the health status of the soil and in turn plant growth and development. However, what needs to be understood at the grassroot level is the fact that each of these parameters at desired or optimum levels, will positively influence plant growth, but may have a negative impact if present in excess or inadequate quantities. Hence the Planter needs to focus on the nature of his or her soil and supplement it with only those required. Applying the correct levels of fertilizers and chemicals not only decreases the cost of production but more importantly it protects the soil micro flora which brings about microbial transformations beneficial for a healthy and resilient soil system. With today’s modern day tools like drones and satellite mapping, the Research wing of the Coffee Board should facilitate the Planting community in developing soil passports for each and every block in the respective plantations. This document will enable individual Planter’s, irrespective of size of holding to diagnose soil fertility and productivity related issues and develop block specific fertilizer management schedules for enhancing nutrient efficiency. This practice will safeguard the soil for future generations, increase productivity and also provide several non tangible ecological benefits. As Microbiologists and Horticulturists, we recommend the following in enabling the knowledge of Coffee Planters in either maintaining the fertility status of the soils or rejuvenating the soils. Management of Coffee soils should be a holistic approach where in the Structural, Biological and mineral health of the soil are taken into consideration. The first and prime prerequisite is that every Coffee Planter should own a portable ph. meter. Apart from soil testing, there are many other indicators in maintaining the health of the soil. Prime importance should be given to enumerate the microbial content of the soils block wise to understand the nitrogen fixers, phosphate solubilizers and other beneficial microbes. (In our view point, the technology should be such that each Planter can isolate and multiply their own beneficial microbes, which have acclimatized over many decades. This helps in the early establishment of the native microbes for quick and effective results. This point is often over looked and Planters are invariably applying bio fertilizers from microbes harvested from crops other than coffee as well as from soils unrelated to coffee. Very few Planters understand that such a practice results in competition between the native and introduced microbes. Scientists should devise a kit which is affordable to provide a realistic quantitative figure on each category of microorganisms in the soil. The Soil Scientists at the Central Coffee Research Station should help the Coffee Planters understand in simple terms the significance of Carbon, Nitrogen (C:N) ratio and its importance in the availability and recycling of nutrients. Carbon is the key that impacts and controls many variables or processes in the soil and plant. The amount of carbon in the soil impacts the development of soil structure, water storage and nutrient recycling. This information is of prime importance to manage the organic matter content of the soil. Further, they should also equip the Planting community with the required knowledge to bring down the Carbon, Nitrogen ratio which is invariably wide in coffee soils. Coffee soils have lost organic carbon over the years because of the poor management practices. It is of paramount importance to understand that soils high in organic carbon content enables better rainfall infiltration and also better retention providing drought tolerance too. Scientific reports clearly indicate that every gram of soil organic carbon can hold up to 8 grams of water. The Scientific Community should also recommend to the Coffee Board to enact a legislation to mandate manufacturers of synthetic fertilizers on the use of carrier material, its shelf life in the soil and the overall chemical content which when indiscriminately used, leads to acidity or alkalinity. In simple terms, we need to provide a labeling system to each and every fertilizer on its consequence to the soil ecosystem. 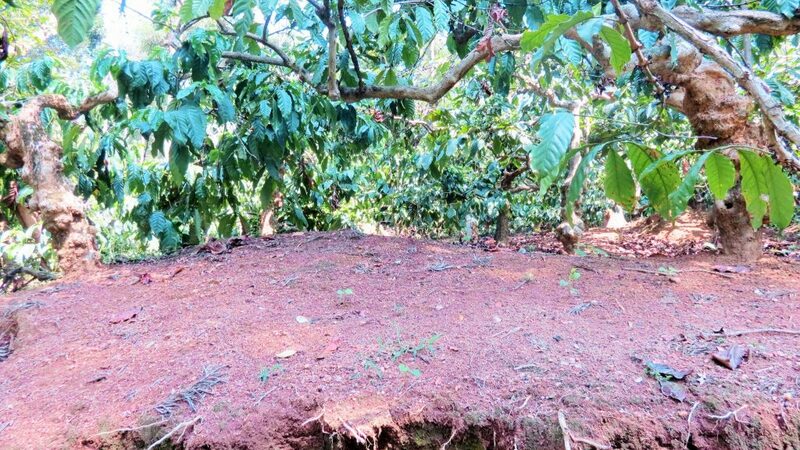 In this brief article we have tried to impress the Planting Community that apart from soil test for physical and chemical properties, one needs to think out of the box and devise protocols that aid in maintaining a resilient and dynamic soil system which is of utmost importance for the future of the Coffee Industry. It is an established fact that in India, we simply cannot adopt Western farming technologies which are often referred to as Industrial agriculture technologies. These technologies as practiced in developed countries where size of land holdings are in thousands of acres as compared to subsistence or small holdings of 10 hectares to 100 hectares in coffee, are ineffective at sustaining soil productivity. (Incidentally more than 95 % of coffee land holdings are less than 10 hectares of land).Restoring soil productivity and ecosystem functions in these contexts requires a leap of faith and new ways of managing soil fertility.